I don’t know why you’re eating seafood to begin with. With mercury, lead, PCBs, dioxins, pesticides, fire retardants, prescription drugs, microplastics, and other chemicals that act as endocrine disruptors, it’s some of the dirtiest food you can eat. It certainly isn’t “brain food.” But if you are, and you live in New York state (which is likely representative of the rest of the country) you may not be eating what you think you’re eating. NEW YORK – Attorney General Barbara D. Underwood released a report today titled “Fishy Business: Seafood Fraud and Mislabeling in New York State Supermarkets,” which details high levels of suspected seafood fraud and mislabeling at New York State supermarket chains. The Attorney General’s investigation, which included DNA testing, found that more than one in four samples purchased was not sold under a federally-recognized market name for that species. 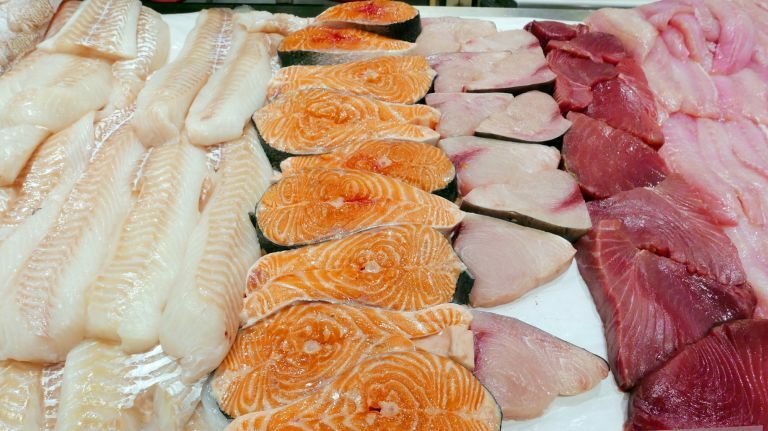 Mislabeling of certain popular species was rampant – including “wild” salmon (27.59% of samples sold as “wild” salmon were mislabeled), red snapper (67% were mislabeled), and lemon sole (87.5% were mislabeled). The substitutes were often cheaper, less desirable, and less environmentally sustainable species. This includes farm-raised salmon sold as wild salmon, lane snapper sold as red snapper, and swai sold as lemon sole. “It’s clear that seafood fraud isn’t just a fluke – it’s rampant across New York,” said Attorney General Underwood. More than one in four (26.92%) seafood purchases with an identifiable barcode was mislabeled. New York City had a staggering mislabeling rate (42.65%) across all samples tested, with similarly high rates of mislabeling on Long Island (40.63%). About two-thirds of the supermarket brands reviewed had at least one instance of suspected mislabeling. While mislabeling affected virtually every tested seafood category, there was rampant mislabeling found in certain species. The results suggest that consumers who buy lemon sole, red snapper, and grouper are more likely to receive an entirely different fish. Similarly, consumers who bought “wild” salmon often got the farm-raised seafood they had paid on average 34% more to avoid. Some substitutes (e.g., lane snapper) had higher mercury levels or came from less sustainable fisheries than the intended species, raising consumer safety and environmental sustainability issues. There was a Whole Foods’ fish labeled halibut that was actually cod. An Uncle Giuseppe’s King salmon that was actually rainbow trout. An Uncle Giuseppe’s lemon sole that was actually flounder. You can see the whole list of stores and tests at the bottom of this pdf file. At one time, eating seafood may have been healthy for us. Today, it’s utterly contaminated. You may as well be licking the bottom of a dumpster. Imagine how the fish feel. This entry was posted in Uncategorized on December 20, 2018 by Bix.